Joel and Sarah were feeling exasperated by their crumbling kitchen cupboards and a disorganized first-floor layout. 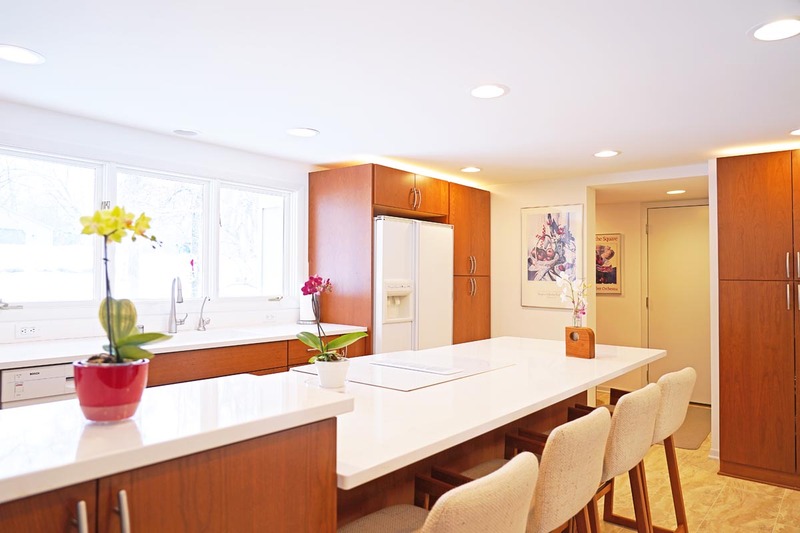 With a plan to completely overhaul their kitchen, maximize the potential of their existing sunroom, and reconfigure the traffic flow of their first floor, they partnered with us on a full-demo interior remodel. We took Joel and Sarah’s kitchen, sunroom, and bath down to the studs and started from scratch, rearranging and rebuilding walls to rechannel their main-floor traffic flow. A cramped kitchen was made airy, accessible, and efficient with a new open floor plan the addition of an island ideal for family breakfasts and coffee breaks. Sarah and Joel’s new kitchen pops with contrasting color. Holiday cabinets add visual interest with a light wooden island and surrounding cabinets in a darker grain. Custom spice racks allow them to be organized cooks, and their quartz countertops add a layer of sophistication. A new floor plan allows traffic to move unimpeded between kitchen and sunroom, letting Joel and Sarah entertain large groups with ease in their free-flowing kitchen and sunroom. During the final walk through, Sarah expressed some misgivings about her kitchen’s paint color. Agreeably, she reassured her designer that she would be able to “live with it”. Though their finished kitchen was already clean and dry, our designer had the kitchen entirely repainted within a few hours. If you’re not totally satisfied with your remodeling work, let us know. We’ll do whatever it takes to make sure that your new space accurately reflects your vision. If something isn’t quite right even after the final walk through, give us a call—we’ll send someone out to resolve it that same day. 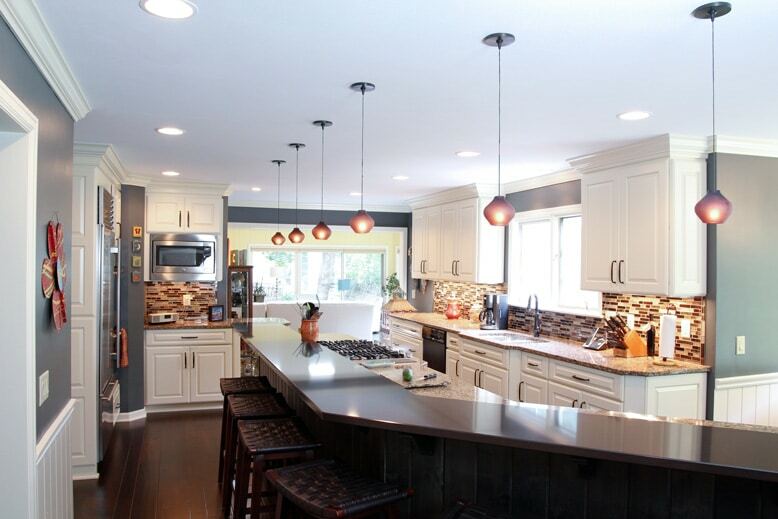 If you’re considering a drastic transformation like Joel and Sarah’s award-winning kitchen, call on us to help you realize your biggest remodeling dreams and invigorate your home. Jeff and Judy’s hole-ridden, 27-year-old siding and leaky, disintegrating windows had seen better days. After deciding to stay put post-retirement, they came to us for a remodeling solution to protect their home from the elements for years to come. Like many home remodelers, Jeff and Judy wanted double-duty siding—something that would both match and enhance their home’s existing style. With the expertise of a dedicated sales person, they carefully considered a variety of pricing options and color schemes before choosing substantial, natural-stained cedar composite siding to suit their home and wooded neighborhood. Tired of damaged and outdated windows jeopardizing their daily comfort, Jeff and Judy decided to remodel with Renewal by Andersen’s® casement style replacement windows. 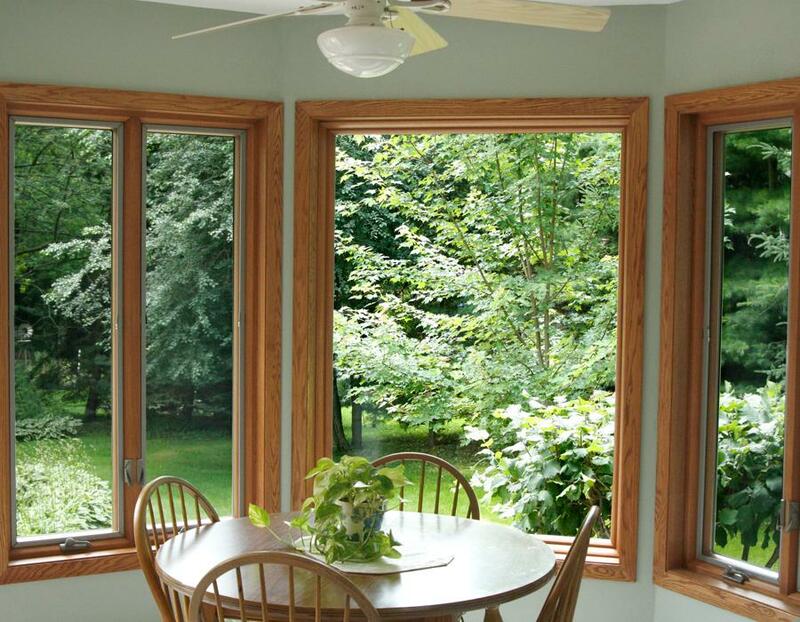 When you choose Andersen windows, you can take comfort in knowing that these high quality windows will provide style and energy efficiency for years to come. Our homeowners love how easy-open and easy-close their new windows are while staying tightly sealed to the elements—and the 20 year warranty doesn’t hurt either. It can be nerve-racking to leave your house open to complete strangers during a remodel. Jeff and Judy were pleasantly surprised to be greeted by kind, courteous craftsmen who left behind a clean house at the end of every day. If other remodeling companies have left your home littered with stray nails or dirty footprints, you’ll love our squeaky-clean working habits. Jeff and Judy’s siding and window project encountered several unforeseen roadblocks. Instead of passing these unplanned issues off on the homeowners, we problem-solved by calling in a skilled electrician and innovating special ipe wood drain systems to repair old leaks in their deck. Post-remodel, Jeff and Judy are enjoying the comfort of their modern, cozy home. They’re in love with their wood grain LP Smartside compressive epoxy-composite siding and top-quality Andersen casement windows—which are both protected by extensive warranties. 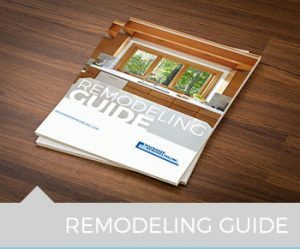 Choosing materials for a home remodel takes time, and we promise not to rush you. Besides our undivided time and attention, you can also expect a full range of materials and unbiased expert opinions. Your home should be your sanctuary. If you’re planning to stay in your home for years to come, don’t settle for leaky windows or battered siding. Solution: Period influenced products including cabinetry, fixtures, and finishes that accommodated reconfiguration to modern day home life and space use. According to many of the participants in our home remodeling this was a “Big Project!” both inside and out. The outside team tackled a new roof, new siding, gutters and downspouts, replaced the chimney flashing and new windows. This was coordinated with insulation improvements, mold remediation, electrical improvements and a new garage door and opener, window cladding, caulking, fascia and soffits and more. The outside crew of Waunakee Remodeling was focused, creative and dedicated to “doing it right”. It was a big job, carefully done with skill and professional attention to detail. The inside team demolished the old then designed and built a new kitchen, powder room, master bath, guest bath, added an entry way mud room and finished the interior of our garage and all while allowing us the homeowners to live in the home while this was being done. The team also coordinated with the electricians, plumbers, heating and air conditioning, dry wall team, painters, flooring, tile and carpeting, cabinet manufacturers, countertop suppliers and carpenters. As they said it was a big job. We were able to be away from the project for a period of time during the work, but we were also able to observe the work in progress. Weather delays or other slight challenges did not distract the teams focus on completing the project on time. Out project manager kept us updated daily through the project when we were not home. While we had a contractual relationship and the parties performed as agreed it seems inadequate to just pay the bill and be done with it. This was a big job with lots of moving parts. Many things could have gone astray. In addition to the overall cost it was a strain on us the homeowners to see our home go through this transformation. But through it al we had confidence that the Waunakee Remodeling team and their supporters would pull it off-and they did! As we settle back into our home (our renewed home) we would like to just take a moment to acknowledge the skill, professionalism and dedication to all the crafts folks that tackled this project. The sales team, design team, planning, scheduling and the entire craftsman crews that executed the plan. So with gratitude and appreciation for the skills and professionalism you brought to this “big project” we send you a “Well Done”. You earned a ten.